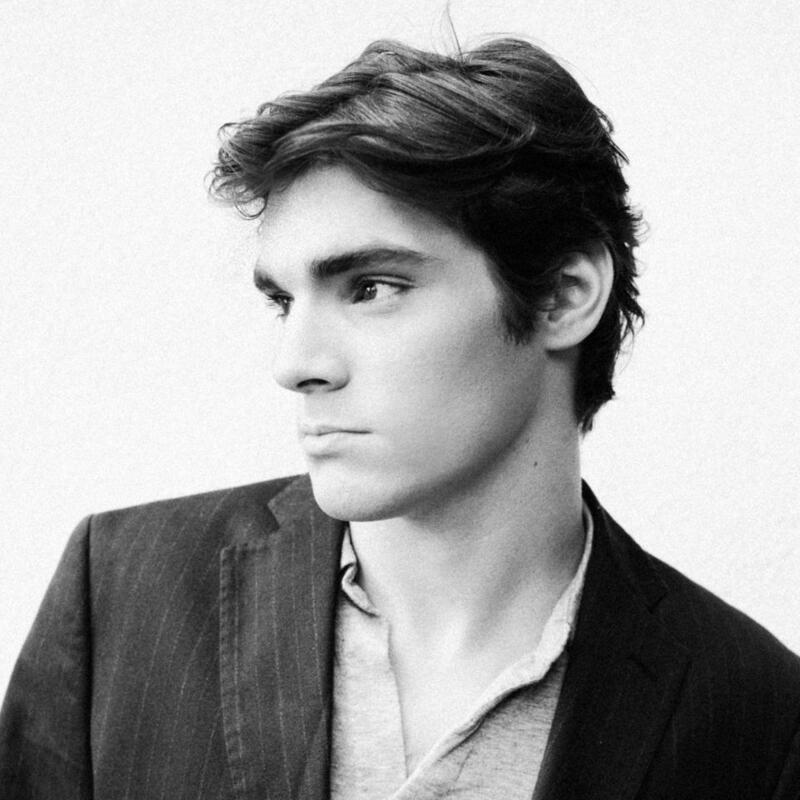 RJ Mitte (that’s RJ for Roy Junior, and Mitte as in ‘witty’) has a lot of spokey dokes on the bicycle wheel that is his career. You probably know him as Walt ‘Flynn’ Jr from Breaking Bad, the breakfast-loving moral compass to his onscreen science teacher-slash-drug-overlord father, Walter White. But you might not know that he’s also a catwalk model – his first gig was for Vivienne Westwood, so no big deal or anything. Or that earlier this year he did a Breaking Bad-themed DJ tour of the US, spinning tracks under the banner of ‘Breaking Beats’. Or, perhaps most impressively, that he spends about a quarter of his time on charity work, repping for disability and anti-bullying campaigns. Let’s just say that he’s got the seven habits of highly effective people totally figured out. Just like his character on Breaking Bad, RJ was born with cerebral palsy, although his condition is milder than Walt Jr’s. At school he was preyed upon by bullies, who broke his hand and his foot. But RJ stood up to them, and these days he’s a spokesperson for anti-bullying campaign Cut the Bull. He’s also a spokesperson for United Cerebral Palsy and I AM PWD (PWD = performer with a disability), which advocates for better representation of people with disabilities onscreen and roles for actors with disabilities. RJ’s mother raised him on her own after separating from his father. He gained a little sister at the age of 11, and when she was talent spotted for a commercial as a toddler the agent also saw something in RJ. Then shortly after he began his acting career, his mother was paralysed in an accident. (Fortunately, she eventually gained back the ability to walk.) At the age of 13 he took on financial responsibility for the family, and continues to support them to this day. Lucky for us, RJ found also some time in his busy schedule to talk to The Vocal. Here he is! You’re here to talk about overcoming adversity and you’ve had some pretty big challenges in your life. What’s been the toughest? I think the hardest thing in life for me is to continue the work, to keep pushing forward. A whole lot of people would assume it’s having cerebral palsy, but the thing is that’s just what I’ve grown up with, it’s everything that I’ve known my whole life. You became financially responsible for your family at a very young age. That seems like quite an extreme thing to happen to a kid in a western country. What happened there? My mother was in a car accident. She was at a stop sign and a car drove into her doing 40 miles an hour and she was thrown into the intersection. She ruptured a bunch of discs in her back and messed up a bunch of things. After six years, through quite a few surgeries and therapy, she was able to walk again. We were living in a townhouse at the time and I didn’t want to go back to living at Grandma’s. I love my grandparents but we’d just got a new place in Texas. The thing is that at the end of the day these challenges will present themselves. You can’t allow them to get you down. I’m fairly stubborn so I wasn’t giving up. How did it feel to be able to take care of things for your family? I think it’s one of those situations where it is what it is and you’ve just got to keep on working towards what you want. I still take care of them today. I’m working a lot more, I travel ten months out of the year. I think the thing in life is to make sure your family’s happy and be able to provide for them. You dealt with bullying when you were a kid. How did you deal with it? I did get bullied, and the thing is I never allowed myself to be manipulated or intimidated by the insecurities or the fear that other people tried to place upon me. When it came to bullies I’ve always been able to stand up for myself and for what I believed in. I was lucky, I had friends and family there to support me. These days online trolling is a really big form of bullying and it seems like nothing really works to stop it from happening. Have you got any ideas about how to deal with that? This is the thing about bullying – you can’t stop bullying, you can’t prevent bullying, you can’t end it. With online trolling I think it’s the same thing – you can’t give them power. I get my fair share of online trolls and the thing about trolls is they just go back under that bridge. They can just stay in the shadow. And those people are not very happy, because a lot of the time what people say to other people is what they think about themselves. Tell us about I AM PWD. What’s the situation like for disabled actors in Hollywood, and what needs to change? I think the situation’s definitely evolving and has grown to a new level. When I first started with that campaign the main goal was bringing awareness to the directors and producers of the importance of having disabled characters on television. Because if you can change the mindset on how they see disability you can affect the generations to come and how they respond. I think over time we’ve been able to have an impact, but we still have a long way to go. I think the hardest thing is to remind them that having characters and people with disability on set isn’t a liability but instead an asset, and it can be very lucrative. You’ve described it as an untapped market – what do you mean by that? It really is. People want real characters. They want honesty and truth, that’s what people want to see now. Obligatory breakfast question: Walt Jr was well known for his love of breakfast. Melbourne is the breakfast capital of the world. What's your favourite breakfast? I don’t really eat much breakfast. I’m a bacon guy. I usually eat breakfast between the hours of 2am and 4am. Is that because you’re up early or up late? That’s because I’m usually up late. So you get it in early before you go to bed? You get so much stuff done – acting, modelling, DJing, all the campaigning that you do. Do you think you’re a bit of a workaholic? Yeah, I would think so. I enjoy working; I don’t like to sit idle and do nothing. I always like to keep pushing forward. I have my moments, I can be a workaholic but there’s nothing wrong with that. When I get a moment, I sleep a lot. I try to get as much sleep as I can when I’m not busy. Hmm. The devil horns. Not the grumpy devil horns – I like the smiling devil horns. I think that’s my main emoji. And the one where it’s just teeth. Those are the two; the devil I use the most. What's the main thing you hope audiences take away from your talks here? I think the main thing I want them to take away is they don’t have to be compliant, they don’t have to be manipulated by their own fears. People need to realise they have so much more power than they understand, and at the end of the day you can have a greater impact than you can imagine. And it’s not just the impact on your life, it’s the impact on your family’s life, the impact on the people around you. You can impact so many people with such little effort. I think people just need to be reminded of that.